Noisy Synths, Pads and Drones. You are really good. Can you come over to my house and teach me your secrets? You are really good. Can you come over to my house and teach me your secrets? :) Favorited and downloaded! Can you take a screenshot of your DAW recording for this piece? I'm super curious! the first track is an fx, noise burst thing that goes through reverb and stuff that i spent too much time with, the 2nd track is the main melody, i started with a pad sound but i then used it for that very simple sequence. This is where I spent most of the time as I did not like the tune at first and redid it a couple of times. I think i wanted to do a whole different thing in my mind at first, which happens all the time to me. the rest of the tracks are just basically expanding on that same simple riff but played with other vsts. then there's the drum track which is just super reverberated kick and a drum machine open hat sample, and a tape noise loop. [quote=Bleeoop] [/quote] the first track is an fx, noise burst thing that goes through reverb and stuff that i spent too much time with, the 2nd track is the main melody, i started with a pad sound but i then used it for that very simple sequence. This is where I spent most of the time as I did not like the tune at first and redid it a couple of times. I think i wanted to do a whole different thing in my mind at first, which happens all the time to me. 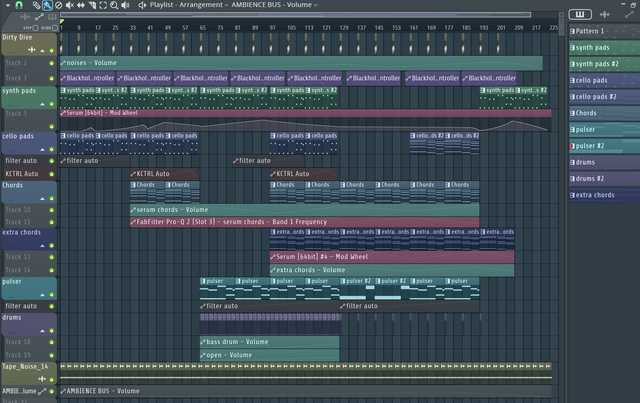 the rest of the tracks are just basically expanding on that same simple riff but played with other vsts. then there's the drum track which is just super reverberated kick and a drum machine open hat sample, and a tape noise loop. this is really educational, thanks for spending the time to share that! very inspiring. Music for a very comfortable haunted house (that I'd like to live in).